Get the useful travel talk app for your trip! Have you ever thought such a thing as below on your travel abroad? How can I ask CA for what I need to during flight? Although I need to ask airport staff for information, they mention there is no English-speaker there. How can I tell a hotel staff about broken facility in the room or request to change a room? I would like to know more about cool places such as shops and restaurants from local people. How can I tell a shop staff to buy what I want to at a shop? How can I explain when I get into a trouble? How can I explain when I get a sick? This "Just Quick'n Easy Korean" is an excellent app for every situation on your trip to Korea. Additionally, it is also included expected answers not only questions. Therefore it is very useful to communicate with polices and a doctor for urgent situation goes smoothly showing phrases with voice sound on the screen. Also it is easy and handy to use! 1. Select situation on the page of contents. 2. Choose detailed situation on next page. 3. 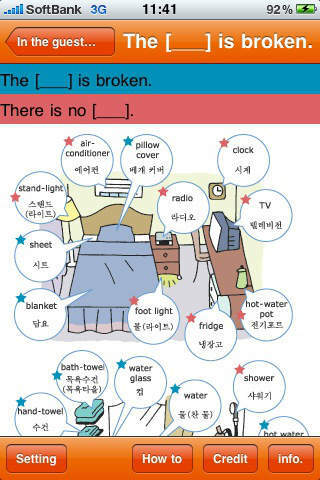 Tab an English phrase what you want to tell. 4. Then play voice sound of translated phrase on iPhone. It is also able to adjust volume and option is automatically saved without frustration in every time to open app. Once you use this app, you will become hooked on it! This app, that is also good tool for practicing Korean pronunciation, is developed simplified system for easy to use on iPhone without any additional functions. Don't forget to get it for your travel in the future! *This content of application is developed for iPhone/iPod touch, which is based on the series of "Mochiaruki Anshinkaiwa Book Tabino Rakuraku" published by Gridmark Solutions Co., Ltd.